Marie has long worn bright red lipstick and it’s become her business trademark and calling card. Now as a cancer survivor, this practice has evolved from a fashion statement to an important message to her family, friends and followers—she “will still wear red” to help remind people to get life-saving skin cancer screenings. The cancer was successfully removed by a surgeon at another hospital, but it left Marie with a disfigured lip. The plastic surgeon said there was nothing more that could be done, despite her lips showing a 1/4 inch difference when compared side to side. Having recently unexpectedly lost her life partner and business partner, Marie was facing personal and professional challenges that were greatly exacerbated by her disfigurement. Not one to take no for an answer, Marie returned to Dr. Rubenstein to seek a solution for her situation. “Thankfully Dr. Rubenstein listened compassionately and took action,” said Marie. “She got me through it.” The doctor used fillers to even out Marie’s lips and significantly reduced her scar within a week. Marie is pleased to be cancer free and happy that her face is now a part of her journey, not all of her story. Marie considers herself a survivor. When something feels too big for her to handle alone, her knee-jerk reaction is to find out how she can help others to deal with the same situation. Since she is already known for wearing bright red lipstick, Marie had an idea to help others. 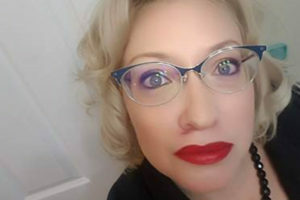 She started a campaign on Facebook, using the hashtag #IWillStillWearRed to ask her friends and followers to take a picture wearing lipstick and commit to getting a skin cancer screening within a year. Angel Rivera, D.O., is a board-certified internal medicine physician with Swedish Covenant Medical Group. His clinical interests include endocrinology, integrative and functional medicine, lifestyle and exercise. He treats a full range of conditions, including chronic illness, cardiopulmonary conditions, autoimmune conditions, irritable bowel syndrome (IBS) and major and minor psychiatric conditions, including insomnia. Emily Rubenstein, D.O., is a board-certified dermatologist with Swedish Covenant Medical Group. who treats medical and cosmetic skin conditions in adults and children. She attended Midwestern University for medical school and completed her residency at Nova Southeastern University/Broward General Medical Center in Fort Lauderdale, Florida.